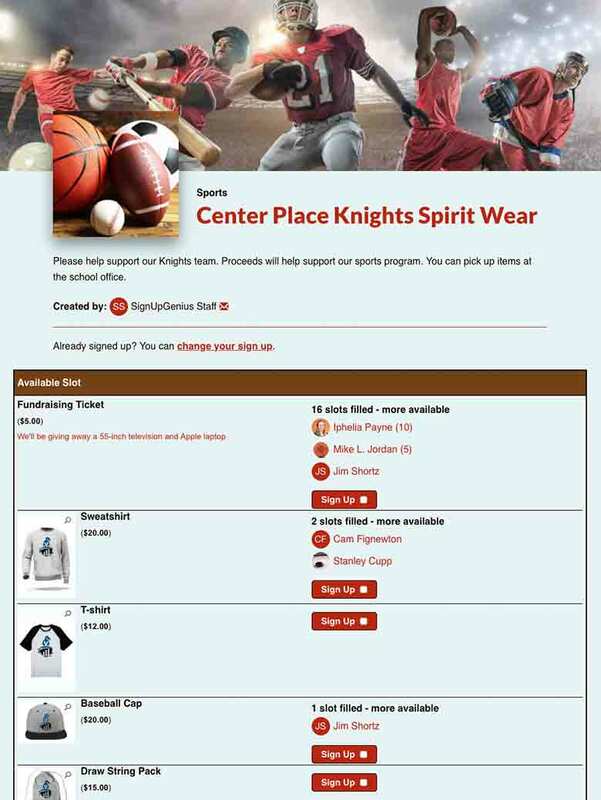 Collect Money for Fundraisers, School Spirit Wear, Tickets and More! 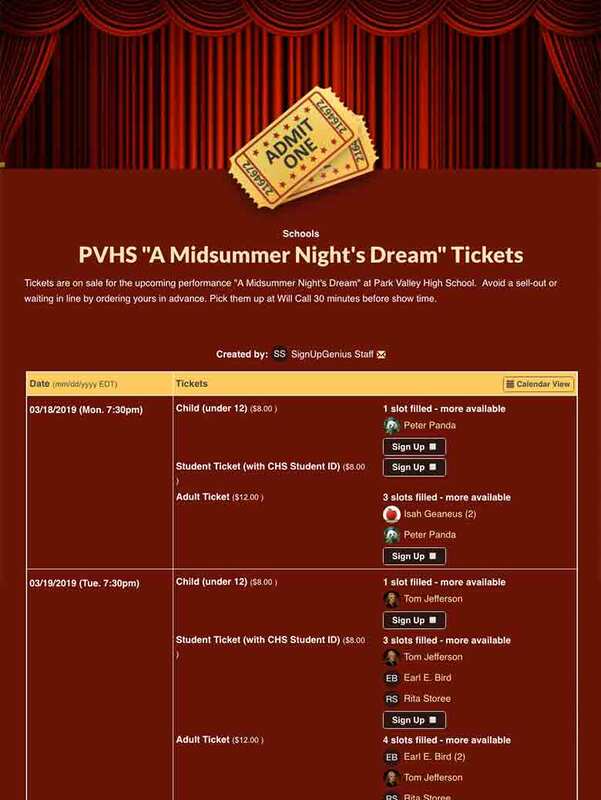 Easily set up payments for school spirit wear, theater tickets, fundraisers and more using online sign up sheets. Build a sign up with our step-by-step wizard to raise money or sell tickets. Payments can be optional or required. 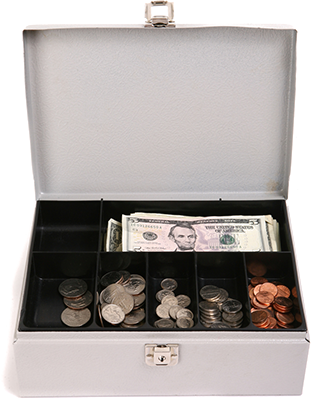 Collect money online and display product images on sign ups to simplify orders. Encourage increased giving with a sign up that makes online donations easy. 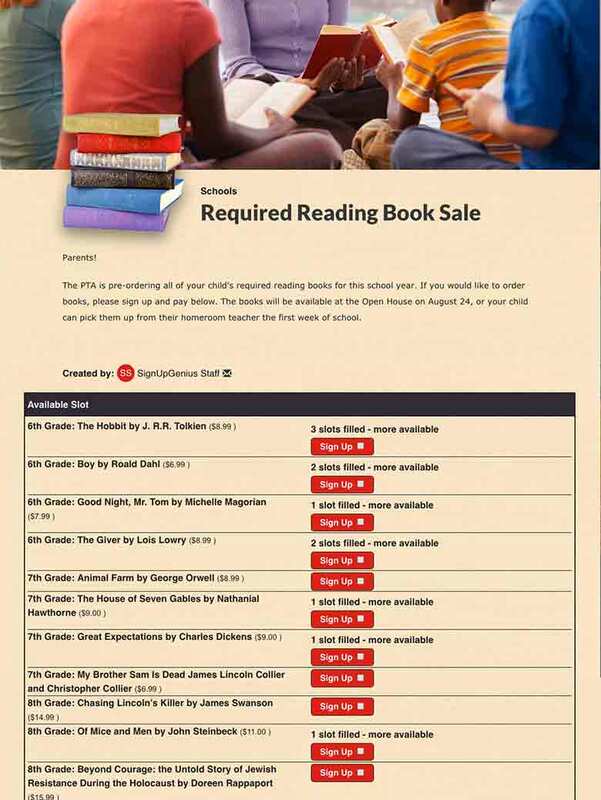 Make it simple for students to buy required and summer reading with a sign up. 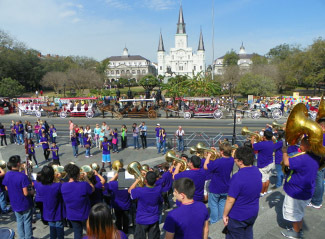 Offer advance sale tickets for school theater productions and sporting events. Reach busy parents with email reminders to pay for programs like after-school care. 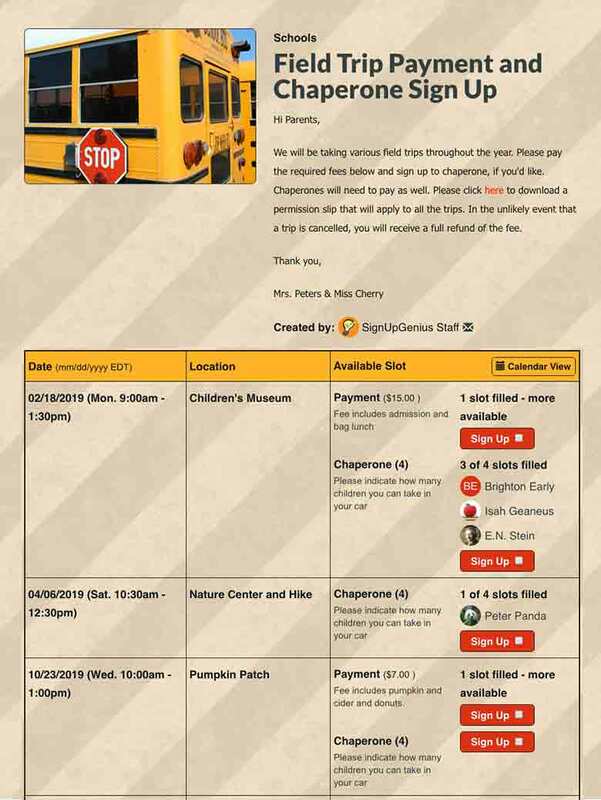 Ask parents to chaperone a field trip and collect fees on the same sign up. We started using SignUpGenius last year for our school fundraiser and other school activities. Volunteer activity is up significantly since we started using this site. It's so much easier to organize too. I like that the site is always adding little features that make things more efficient and customizable. Great site and great service. I used SignUpGenius for our school book fair, a five-day fundraising event with multiple tasks covering approximately 30 time slots, and it required dozens of volunteers. 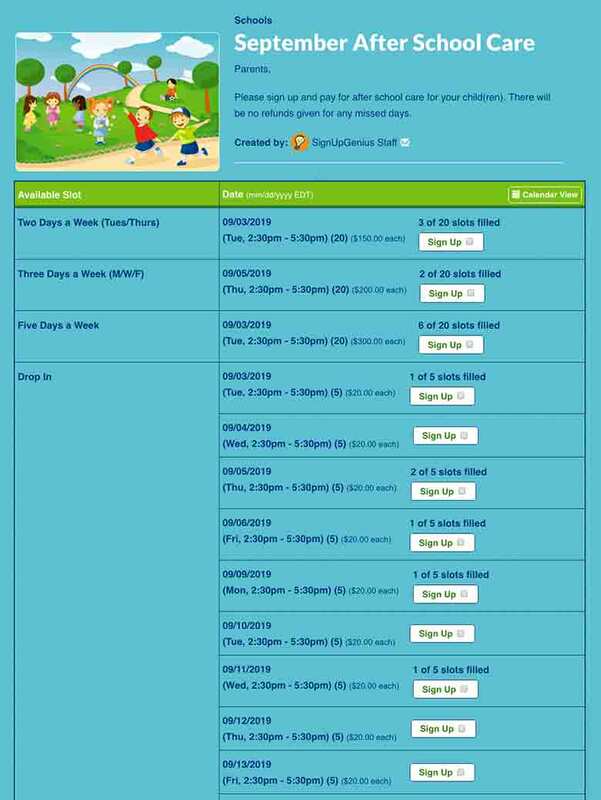 Scheduling the volunteers was a thing of beauty because of this website! SignUpGenius is amazing! I've used it for a few years, but this year we upgraded ... and it has been a game changer for our school! Being able to have that summary page with all the school sign ups together and being able to have multiple admins is well worth the cost of the yearly membership. 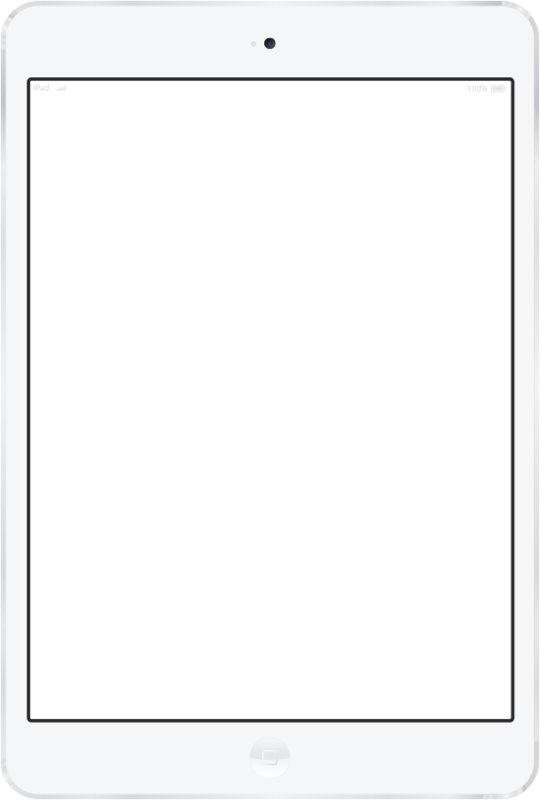 ... Each time I think of ideas for new features, I find that you are already way ahead of me. Thank you so much for all you do! SignUpGenius, I love you guys! My book fair volunteer effort used to be the pits - hundreds of emails with tons of overlap and random problems. Then I found you guys, and my project has been rainbows and unicorns ever since. No more multi-day long email threads to discuss a two-hour time slot, no more toggling between emails, drives and Excel, no more dealing with people when I have a million other things to do! Thank you for your service to an overworked community of teachers!